The NISEI Board Rezzes… Public Support! You see, we all love Netrunner. I love Netrunner, you love Netrunner, even world-renowned grumps like @shanodin love Netrunner. And what makes Netrunner great? So NISEI have decided to say a little thank you to the people who go the extra mile for the game, and that thanks comes with a little present and as much recognition as we can give. Every month we’ll name a person who we think is doing a fantastic job making our game the most excellent version of Sitting In A Room (#uk Slack meme there for ya) there is. To kick it off, we’re going to pick two people who we think have gone above and beyond in one or more aspects of their work in the community. John O’Brien (aka @Johno) : Co-Founder of the NeoReading Grid channel, the Dead Channel podcast and creator of cobr.ai – which if you’ve never used it, is a fantastic tool for running events. Johno is a well known member of the UK community who has definitely made his mark on the landscape. Scott Pagliaroni (aka @Spags) : Host of the King of Servers events at Worlds since 2015, and heavily involved in ANRPC, Spags makes so much stuff happen I can’t even list it all here. While we’ve been able to hand these over in person this time, in future we’ll be posting them out and conducting interviews via slack/email/whatever in time for an announcement on the what will usually be the first Friday of every month. Johno: I was introduced to it by the original Android board game! I loved the flavour and setting so much and looked past the clunky-as-hell mechanics. It was a great world to swim around in and was packed with flavour. I remember getting excited when I heard announcements about two games set in the same universe: Infiltration, a Donald X Vaccarino game about a data heist gone wrong, and a remake of some 90s card game. I picked them both up as soon as they released, and suffice to say, one stuck around a little longer! Spags: I was in from the jump. I played some Netrunner (ONR) back in the day, and I was excited to both try it again, with factions this time, and also get in at the sweet price point afforded by the LCG model. In October 2012, I showed it to my friend Aaron Andries at a local board game meetup, and the rest is history. S: Like any nerd worth their taped up glasses, I have been gaming most of my life, over 35 years now. Video, board, card, miniature, dice, and more games have all been tried, but I have found card games to be most to my liking. In that regard, I played Hearthstone for a number of years, hitting Legend a few times, but I retired the game earlier this year. Gwent is another one I have played recently, and am really looking forward to the relaunch this fall. Finally, Artifact intrigues me, based on the names behind it, but the raw CCG format is a bit daunting. I also enjoy a variety of board and video games, with a preference for card-driven wargames and turn-based strategies. J: I own all of the Arkham Horror LCG, and think it’s great. The theme and mechanics are so well intertwined and I recommend it to anyone looking for a really slick cooperative game. Apart from that, I play board games pretty regularly at work where I’ve introduced a few colleagues to some classics. One of my all-time favourites that we play regularly is Hanabi. J: I was devastated. I’ve got so much enjoyment from the game, and made so many friends playing it, that I was very sad to see that it would be ending. I hope Nisei can maintain the momentum that the game has built up! S: I was pretty sad, like most. Had a good cry about it a few days after the fact, like when a loved one dies. However, based on information I received from some playtesters since Worlds 2017, things sounded very slow, and grim, so I wasn’t shocked. S: Being an older member of the community, and have already been a larger part of a card game community before having played Legend of the Five Rings (L5R), I felt that I could help build the game in some ways, via the community. The real inspiration was after Gencon 2014. We thought it was cool that FFG was working with distributors in other countries to fly national champions in, as early as Worlds 2013. However, when the winner of Gencon 2014, who was from Quebec, noted that they couldn’t come if FFG didn’t help (he didn’t, I believe). The was the main impetus for the formation of the ANRPC. 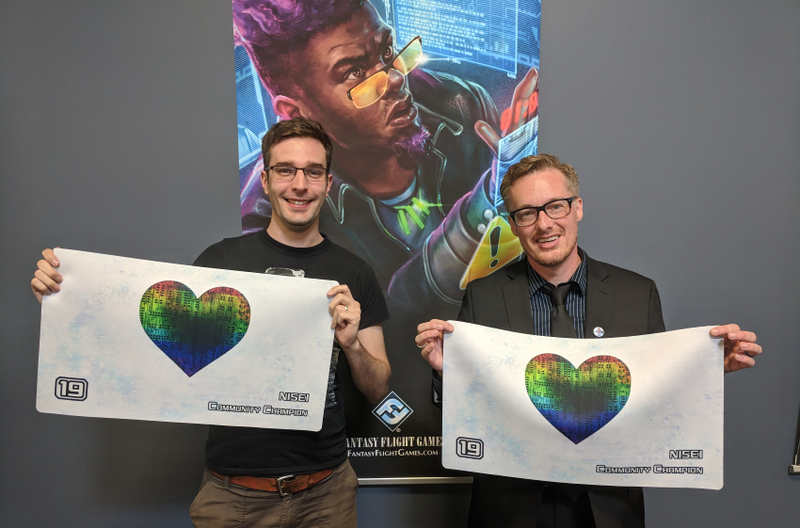 Our goal was to send people from various regions across North America to Worlds, and we succeeded, both in helping people get there financially, and by perhaps spurring FFG to do the same going forward. J: It started with wanting to share the game with others. I ran local events and leagues and helped to establish a local scene. Once I was in the community, I just wanted to keep giving back to it. All of my projects have at their core been about wanting to share, talk about and think about the game with the friends I’ve made through it. J: I find it fascinating how unique the game is. I’ve tried other card games, like Thrones, L5R, etc and Netrunner is just so different to all of them. It’s a competitive puzzle to be solved, and the hidden information and counterplay is what makes it so great, and so much more interesting than other games. It really is one of a kind. S: The players. I had a similar feeling about L5R, that the game became more about seeing and hanging out with the community than winning. We had various teams there, clan loyalty, and more, but in the end, winning wasn’t as important as the friendships made. I love many in this community, as I did in L5R, and the inclusivity, memes, comradery, friendship, and support shown by most has really made it hard to see FFG end it. S: I really don’t like to associate with a faction, but, I would have to pick Shaper. In reality, I would learn more Anarchistic in my worldviews, but, my gameplay is green through and through. The ability to have so many lines of play available at any given time, even mid-run, is such a great feeling. It probably helps that I helped birth two of the more well known and popular Shaper decks throughout ANR’s history, in Pitchfork and Prepaid Kate. I consider them to be my ANR offspring. J: Well, I have a well-known preference for the criminal faction; they’re my favourite to play. Based on my job though (I do application development in a cybersecurity consultancy), I would almost certainly work for Globalsec and be part of Sunny’s faction. S: Kate and Near-earth Hub (NEH). Both were strong, and versatile. If Kate remains retired, then Lady Hayley. S: Architect. I remember putting three into my NEH deck at Worlds 2014, when it first arrived on the scene, and every faceplant induced groans. I always feel that on the other side, even if it’s early in the game, and the pain is minimal. Great card. J: DNA Tracker. That thing’s the worst. J: Minifaction. He doesn’t have quite the same style as shaper, but he does have a lot of criminal cards that are his and no-one else’s. I wouldn’t call him a shaper as such, although Levy would be one of the first cards I’d look to include. S: LOL, nice. He is definitely a Criminal; he runs a giant gang! He shares more affinity with Shapers, now that he can date Lady Hayley via their friend DJ Fenris. If he’s in any faction, it’s the Tech faction; remember, he’s a Lord of it. S: Astroscript Pilot Program. I know, it’s a broken, hated card. I know that it probably should have been made into a 4/2, or a ‘one per deck’. Even when FFG errata’d it to the latter, it got moved on. It was such a fun enabler of the kind of B.S. that normally only Shaper gets up to, and I would like to see it back as a one of. J: Desperado, although it’s kind of been re-released in a watered-down form now. Getting value from runs is my preferred way of playing; it’s interactive and at the very core of Netrunner. Johno, what inspired Cobra, and how do you feel about it being used for such large events? Did you see anything like that happening when you started work on it? Easily the worst part of large tournaments in the past was the paper printouts of pairings, as a couple of hundred people huddle to get a brief glimpse. It made the turnaround for such events incredibly slow and awkward. There are plenty of (very good) options for running a tournament, but I particularly wanted one that would allow players to view the pairings and standings easily. It also had the side effect of improving the lives of people following along from a distance, instead of waiting for a photo of the standings on Facebook. I’m so glad it’s become well-known enough and trusted enough to be used at even national level events; I’m very proud of it. Spags, what inspired KoS, and how do you feel about how popular it’s become, with other events having their own similar formats? KOS was inspired by two things: FFGOP, and Dan D’Argenio. The latter did more work behind the scenes than you’d think, working hand in glove with the ANRPC and Stimhack. His ideas and suggestions led to both the format of KOS, and the initial run of Corp IDs we handed out, using word, metal, carbon fibre, and acrylic. I really was dismayed at FFG’s Worlds offering, especially the lack of space and side events. I felt we could have our own fun event that would provide a nice contrast to the competitive grind of Worlds. The popularity of it really warms my heart. Not only is it the most diverse meta, by force, but it’s probably one of the more casual and fun ones, as well. I hope this year continues that trend, with the legality of the Champ data pack. I am also glad to see many other people trying the format around the world. Having never played the format, I can’t speak for its entertainment value, but people seem to love it in the moment. Applications for NISEI recruitment were extended through Sunday, 9 September at 11:59 PM GMT. After Magnum Opus, we’ll be digging through these and reaching out to many of you. Once again, if you’ve got questions, we’ve (probably) got answers! You can anonymously submit questions and they’ll be answered publicly here. Tune in next week for an interview with @icecoldjazz, NISEI’s Organized Play Manager. Same time, same (back) channel. Until then, get involved, spread the word, and ALWAYS BE RUNNING!